The process of producing synthetic genes which are then inserted into DNA is known as gene synthesis. Gene synthesis is a method used to produce synthetic genes which can be inserted into DNA sequences. There are a number of uses for artificial genes, ranging from pure research to the development of crops which can resist certain pests. A number of firms worldwide offer gene synthesis to their clients, using a variety of techniques and equipment types. The cost for gene synthesis is also relatively low, making the process affordable for researchers and institutions of all sizes. 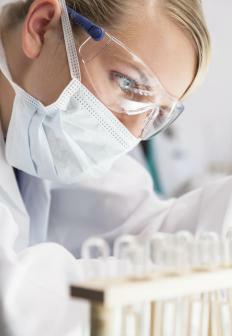 In gene synthesis, the person requesting the artificial gene sends the data to a lab, and the lab constructs the gene. The snippet of DNA which makes up the synthetic gene is encoded into a vector which can be used to insert the gene into a strand of DNA. The vector commonly includes markers so that it will be easy to find the gene; these markers can also be used when researchers want to look at genetic mutations, or track synthetic genes when they are used in applications such as agriculture. This method lies in contrast to cloning, in which a scientist makes a copy of an area of genetic interest from an existing DNA sample. Cloning can be problematic and prone to errors, and it can also be very time consuming, as the gene needs to be carefully identified and verified. Gene synthesis also allows scientists to change the nature of the gene and the way in which it expresses proteins, a very useful trait. Labs may also perform gene optimization, in which a gene is adjusted to ensure that it will express properly when it is inserted into a new organism. For example, if a gene which confers pest resistance is inserted into corn, the proteins may not express as desired because of limitations and conflicts in the corn. In these instances, the gene synthesis process will include steps which optimize the gene so that it will work with the organism it is inserted into. While the ability to utilize artificial genes has a number of advantages for scientific researchers, it is also accompanied with some ethical and legal issues. Because gene synthesis can be ordered by anyone in the world, there is a possibility that someone could use labs to create dangerous pathogens, by ordering small snippets from multiple labs and stitching them together. Synthetically produced pathogens could pose a serious problem for governments fighting biological warfare, as the pathogens would be difficult to identify and treat. What Are the Steps of Protein Synthesis? What is in Vivo Gene Therapy? What are the Different Types of Tay-Sachs Treatments? What is a Gene Interaction?